Cosmetic or functional problems can occur in people of any age. In most cases, adolescents should wait until they have finished their growth spurts before undergoing rhinoplasty, usually at age 15 for girls, a bit later for boys. During rhinoplasty surgery, the skin of the nose is separated from the supporting framework of bone and cartilage. The framework is reshaped and then the skin is redraped. Rhinoplasty surgery can be either open or closed, with the choice depending upon the nature of the problem. In a closed procedure, we make the incision inside the nostrils and the nose is reshaped from the internal incisions. In an open procedure, we make a small incision across the columella (base of the center of the nose) and resculpt the structures under direct vision. In some cases, cartilage or bone grafts may be required. Open procedures are preferred for more complicated cases. We will discuss which option is best for you at your consultation. Simple procedures take from one to two hours; more complicated surgeries will take longer. 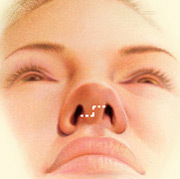 Many patients undergo rhinoplasty under local anesthesia with sedation, while others require general anesthesia. Surgery is usually performed in an outpatient setting. You should expect temporary swelling and bruising around the nose and eyes. Headaches and nosebleeds may also occur, and temporary nasal stuffiness is to be expected. After rhinoplasty, most patients can return to work or school within one to two weeks and resume strenuous activities within two to six weeks. The nose takes some time to settle into its new shape, and the final appearance may not be achieved for a year or more. Rhinoplasties performed to correct congenital deformities, relieve breathing problems or repair defects caused by trauma may be covered by insurance. Cases are judged on an individual basis and may require preapproval. Overly large nose may be reduced by removing bone or cartilage. Sometimes surgery of the nose may require the addition of cartilage grafts. The decision to have plastic surgery is extremely personal. You will have to decide if the benefits will achieve your goals and if the risks and potential complications of rhinoplasty are acceptable. These risks and others will be fully discussed prior to your consent. It is important that you address all your questions prior to surgery.